Not only does this delightful stage show boast an award-winning director and producer, it also boasts music by award-winning composers Robert Lopez and Kristen Anderson Lopez—the dynamic duo that went on to write the music for Disney’s blockbuster Frozen. 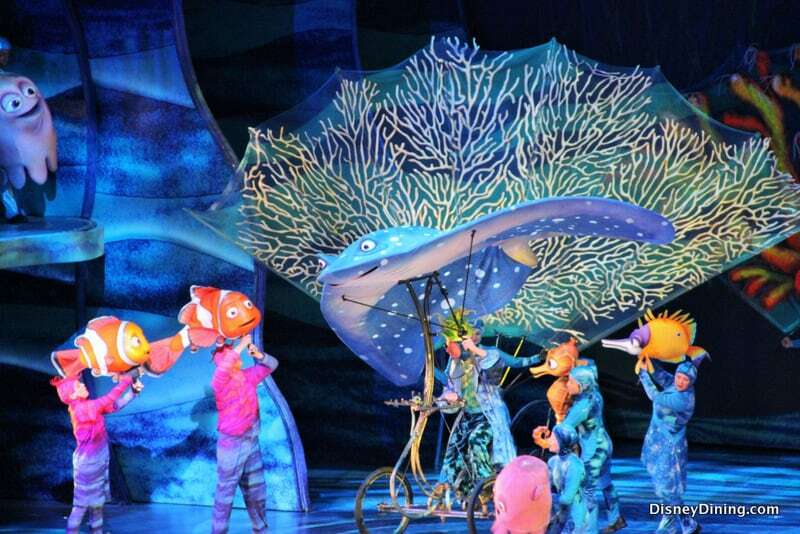 The two were responsible for such songs as “Do You Want to Build a Snowman” and “Let it Go.” Extravagant puppetry and camouflaged puppeteers add to the believability that Guests are actually watching the story take place underwater. Some of the puppets are massive too! Nigel the pelican stands 22 feet tall, and the puppet version of the Crush Man is the size of a Volkswagen Beetle! Set out on the adventure to find Nemo with Marlin, Dory, Bruce, Crush, Nigel and all the beloved characters from Disney/PIXAR’s Finding Nemo when you visit Animal Kingdom.